After years of dedication to gymnastics and a brief stint on Broadway, this University of Maryland graduate retired to focus on her passion to encourage, educate and motivate others on the topics of health, fitness and empowerment. 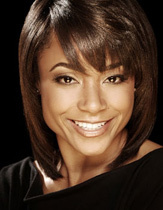 Dominique has served as a co-host for Yahoo! News’ Weekend Edition and as an Olympic correspondent for FOX Sports. As part of FOX Sports’ analyst team during the 2012 London Olympic Games, Dominique recapped daily events and conducted a sit down interview with All-Around Gold Medalist Gabrielle Douglas. While in London, Dominique was also interviewed by top national media including USA Today, Piers Morgan and Good Morning America. She was also a part of the President and First Lady’s Olympic Delegation and had the privilege to conduct an interview with the First Lady. Dominique, appointed by President Barack Obama, currently serves as the co-chair of the President’s Council on Fitness, Sports & Nutrition alongside NFL Quarterback Drew Brees. Through this program she works closely with the First Lady to help promote the Let’s Move! initiative, educating children on fitness and nutrition while motivating them to get moving. Today, Dominique is a highly requested keynote speaker who delivers powerful and inspiring messages on leadership, personal drive, building your foundation for success and living a healthy lifestyle. She has the unique ability to empower audiences, from corporate executives and small business owners, to women’s groups and moms, universities and youth organizations. Dominique resides in the Northern Virginia area with her husband Jeff Thompson and two beautiful daughters, Kateri and Quinn. Building a solid foundation was one of the keys to Dawes' success. Her emphasis on a solid foundation touches on multiples areas: from healthy lifestyle choices to developing positive self-esteem where she addresses issues such as peer pressures, productive attitudes and values. The audience will walk away empowered, motivated, and, more importantly, clear on what it takes to build a strong foundation worthy of your dreams. D-3 became Dawes' personal motto when she was an Olympic athlete in the making. Fatigue, frustration and loss of focus was common is such a perfectionist sport. D-3 kept Dawes focused on what was going to allow her to stay on the path to success. She paints a vivid picture of moments in the gymnastics arena where D-3 inspired her to persevere through setbacks and struggles, sacrifices and insecurities, en route to Olympic Gold. D-3 has become a staple in Dawes' athletic and professional accomplishments. She inspires audiences to develop their own personal motto that will help define and direct them in life too! ENVISION is Dawes' signature message. It is also the title of her motivational line of products. ENVISION is an acronym for the 8 principles that helped Dawes become successful in and out of the athletic arena. She crafts this speech specifically to motivate and empower the audience to envision greatness in their own lives. The core focuses are passion, plan and perseverance. Dominique Dawes won Olympic gold. But, for her, success is so much more than medals and accolades: it's something she worked hard to achieve everyday en route to Olympic glory. Her journey in the sport of gymnastics lasted 18 years and in those years she stood strong on numerous podiums. Leaving lasting impressions in the hearts of fans. The podium was the destination, the long term goal, however, it's the moments in between she calls the "journey" that helped her realize the success that she was always striving for. Overcoming the inevitable obstacles, challenges, and doubts are the moments in the journey that build the champion in Dawes. Surrounding herself with the right team, developing the mindset to persevere and turning negative situations into life lessons is how Dawes realized Success is a Journey, NOT a Destination.